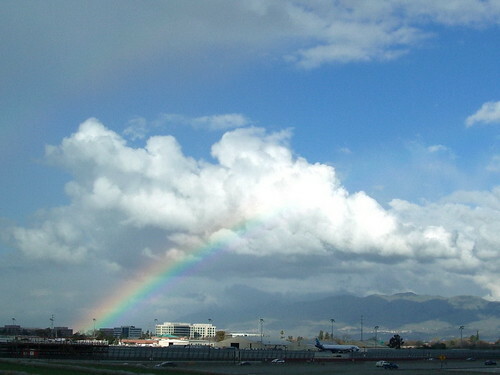 Was heading down to San Jose airport to catch my flight to Las Vegas when I caught sight of this rainbow. I don't recall seeing rainbows when I was in Los Angeles and I think it's probably due to the smog there. The air quality is certainly much better. I didn't think that my camera would be able to capture it when I took the snap. Lucky day for me, I guessed. Spinnee: I was talking to my friends about Hong Kong and Los Angeles about rainbows or the lack of, due to the bad air. I left a reply to the comment you left regarding polygamy. Thanks. Aloe: I used the Casio Exilim Ex-Z1000 to take that shot. Rambling Alcoholic: Welcome to the blog!